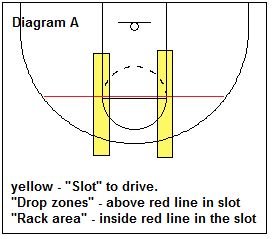 "Slot" - where the top guards attack with the dribble, along the lane lines. "Rack zone" - dribble-penetration in the slot, at the hoop for the layup. 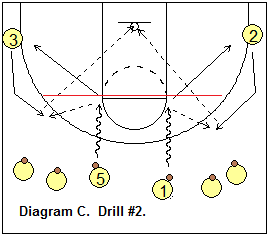 "Drop zone" - dribble-penetration in the slot, stopping short at the free-throw line. Numbering - O1 and O5 are on top, O2 and O3 (good outside shooters) are in the right and left corners respectively, and O4 is the post player. Diagram B. Use both sides. O1 and O5 attack the slots on each side of the lane and dribble into the rack zone (below the free-throw line), and pass to the corner. O2 and O3 take the corner shots. This drill reinforces a key read... if the dribbler penetrates below the free-throw line (rack area), the corners stay put. 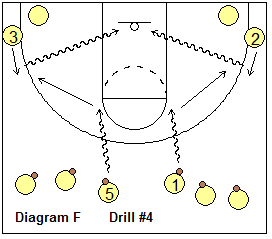 Rotation: dribbler goes to corner line, shooter rebounds and goes to the top line. Diagram C. Use both sides. O1 and O5 attack the slots on each side of the lane and pick up the dribble in the drop zone (above the free-throw line). When the penetrator stops in the drop zone, this is a key for the corner player to rotate, or "loop up", and receive the pitch from the dribbler. O2 and O3 take the wing shots. Rotation: dribbler goes to corner line, shooter goes to the top line. Diagrams D and E. Use both sides. 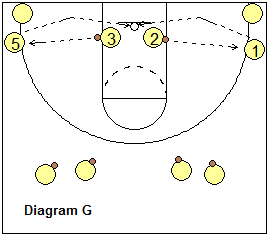 O1 and O5 attack the slots on each side of the lane and pick up the dribble in the drop zone (above the free-throw line). The corner players O2 and O3 rotate up once again and receive the pitch. The passers go to the corners. Now O2 and O3 dribble-penetrate the top seam, reverse pivot in the lane and kick out to O1 and O5 in the corners for the corner shot. Rotation: O1 and O5 rotate to the corner lines, and O2 and O3 move to the top lines. Diagrams F and G. Use both sides. 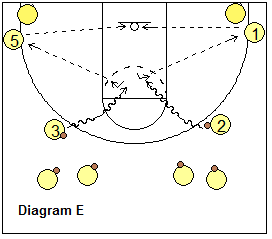 O1 and O5 attack the slots on each side of the lane and pick up the dribble in the drop zone (above the free-throw line). O3 and O2 just come up part way and get the pass, and then dribble-drive the base-line, reverse pivot inside and pass back to the corner to O5 and O1. O5 and O1 shoot the corner shots. Diagram H. The ball can start on either side with O1 or O5. Pass opposite and set the "blur" or "brush" screen.. just a delay or standing still type screen, not a hard screen. The dribbler just dribbles right off the screener's rear. O5 dribbles around the blur screen and shoots. Rotation: You can do this drill with just the O1 and O5 lines (don't need the corners). Diagrams I and J. Use 3 lines (O1, O2 and O3). O1 dribbles to drop zone and pitches to O2. O2 dribbles into top seam and pitches to O3 who has rotated up. O3 shoots. Players should all rebound the shot. Rotation: O1 moves to right corner line. O2 moves to left corner line. O3 moves to top line. After running this to the right side, switch sides and run it to the left side also. Diagrams K and L. Use 4 lines (O1, O5, O2, and O3). O1 dribbles into the rack zone (below the free-throw line) and kicks to O2 in corner. O1 cuts to opposite corner. O5 rotates over after O1 drives and O3 rotates up top. The ball is reversed around the outside from O2 to O5 to O3 to O1. O1 shoots the corner shot. All players rebound and finish the drill. Rotation: O1 and O5 moves to the corner lines. O2 and O3 moves to the top lines. Diagram M. Use both sides. O1 and O5 dribble into drop zones. O2 and O3 start to loop up, but suddenly stop and back-cut for pass and lay-up. O2 and O3 have to "sell the loop" and cut high enough before they back-cut. Diagram N. Use 3 lines... O1, O2 and O3. 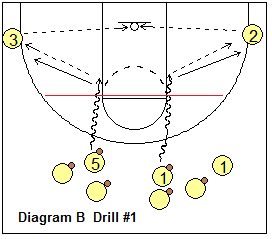 Similar to drill #8 above with dribble-penetration from O1, and an O3 back-cut and pass to O3. Here, O3 dribbles in and instead of the lay-up, kicks to opposite corner O2 for the shot. Make sure players finish the drill and rebound. Rotation: O1 goes to the O3 line, O3 goes to the O2 line, and O2 moves to the top line. After a while, switch sides of the court. Get the remaining 12 drills (all 21 included!) in the Playbook download, or by becoming a Premium Member.